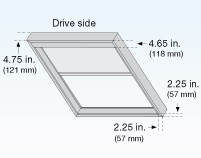 Tensioned shades provide solutions for skylights and angled windows. The innovative design from Lutron keeps fabric panels taut and parallel to windows with minimal sag at a variety of slopes. 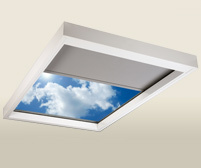 Lutron tensioned shades reduce light gaps around fabric, and maximize the view when opened by eliminating cable guides that are typical in skylight shades. The frame may be surface mounted, inside mounted, or recessed into a pocket while still allowing easy access to update the fabric.